Organized at St. Louis, Mo., May 13, 1862, by consolidation of various Companies State Militia Infantry raised at St. Louis. Served as prison guard and Provost guard at St. Louis until September 28, 1862. 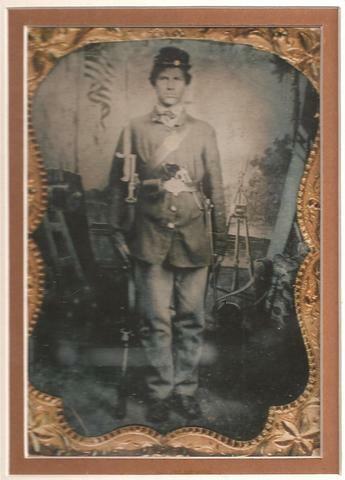 Moved to Pilot Knob, Mo., and duty as bridge guard on Iron Mountain Railroad until September, 1863. (Cos. "F" and "I" at Patterson, Mo., until December, 1862; then return to St. Louis.) Ordered to St. Louis, Mo., September, 1863, and return to Pilot Knob, Mo., October 21, 1863. Duty at various points until October, 1864. Company "E" at New Madrid, Mo. ; Company "D" at Cape Girardeau, Mo. ; Company "H" at Pilot Knob, Mo., and in line of Southwest branch Pacific Railroad and on iron Mountain Railroad guarding bridges. Company "H" at Defense of Pilot Knob and Fort Davidson September 27-28, 1864. Retreat to Rolla and duty there until October 24. Return to Pilot Knob and duty there until May, 1865. Mustered out May, 1865. Regiment lost during service 14 Enlisted men killed and mortally wounded and 1 Officer and 52 Enlisted men by disease. Total 67. Organized at St. Louis, Mo., September, 1864, to February, 1865, from Veterans of Missouri State Militia Regiments. Attached to District of Rolla and Dept. of Missouri to July, 1866. SERVICE.--At St. Louis. Mo., until September, 1864. Operations against Price September to November. Actions at Glasgow. Mo., October 15. Little Blue October 21. Lexington October 21. Independence October 22. Mine Creek, Little Osage River, Marius Des Cygnes, October 25. Carthage October 26. Duty at Rolla until May, 1865. Operations about Stephenson's Mill March 22-23, 1865 (Detachment). Scout from Waynesville March 29-April 2 (Detachment). Scout from Rolla April 21-27 (Co. "M"). Skirmish, Spring Valley, April 23 (Co. "M"). Skirmish near Waynesville May 23 (Detachment). Moved to Fort Larned, Kan., and duty in District of the Plains, operating against Indians, until July, 1866. Mustered out July 3, 1866. Regiment lost during service 11 Enlisted men killed and mortally wounded and 28 Enlisted men by disease. Total 39.